The CONEG Governors have delivered their 2019 Inaugural and/or State of the State addresses. 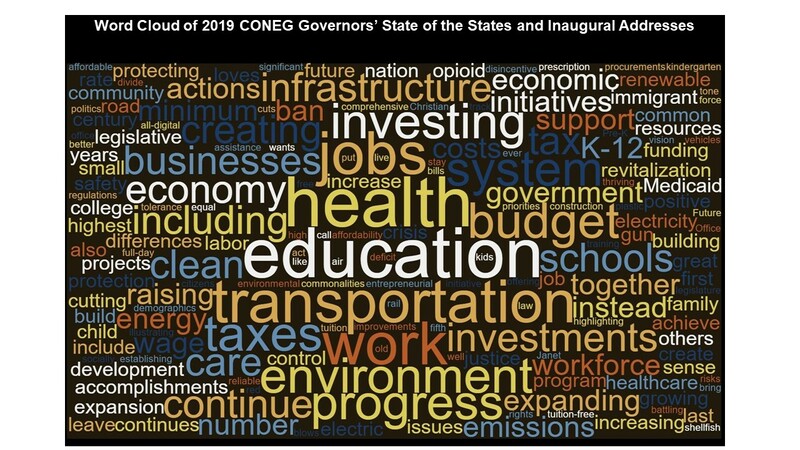 Highlights of their speeches are provided below including a word cloud illustrating the commonalities among the states. After his inaugural address on January 9, 2019, Governor Ned Lamont delivered his first state of the state with a focus on “fixing the budget and investing in the future.” Lamont said “it’s time to return to our inventive and entrepreneurial roots.” Some of his outlined legislative priorities include economic revitalization by investing in an all-digital government; investing in Connecticut’s urban centers; creating a 21st century transportation system including a modern infrastructure by rail, road, air and water; and bringing the workforce into the 21st century by including paid family leave and raising the minimum wage. The governor said “my primary objective is to get this economy growing again.” Read the speech. Governor Janet Mills delivered her inaugural address on January 2, 2019. During her speech, Mills warned that carbon emissions are destroying the environment and climate change is threatening jobs, and damaging health. She pledged to act by embracing clean energy, changing modes of transportation, weatherizing homes and businesses, and reaching a goal of 50 percent of the states electricity coming from Maine renewable resources. Mills said “these actions will create good-paying jobs, preserve our environment, and welcome young people to building a green future here in Maine.” Other actions Governor Mills plans to work on include expanding Medicaid and work to control costs of insurance and prescription drugs; develop a world-class workforce; achieve a better education system; and creating an Office of Innovation and the Future. Read the speech. Governor Charlie Baker delivered his inaugural address for his second term on January 3, 2019. Baker touted his leadership on a few national issues with accomplishments in the highest rate of health care coverage; best gun laws in the nation; and a K-12 education system that is the envy of the country. He also touted progress on eliminating the Commonwealth’s structural budget deficit and ending last year with a major budget surplus, and all without raising taxes. Baker noted his work with the Legislature on two procurements that will lead to 50% of electricity being generated by clean resources, and over 200,000 jobs have been created since he took office. 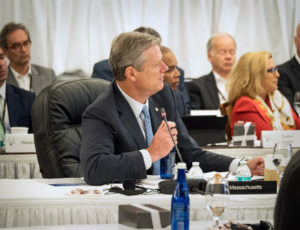 Baker wants to continue progress by investing in public transportation and infrastructure; reduce greenhouse gas emissions; increase in housing production; criminal justice reform; control healthcare costs; prevention, education, treatment and recovery of opioid addiction; support great schools; grow the economy; clean up the environment, and promote justice. In wrapping up his speech, Governor Baker said “This state is bursting with talent, humor and decency. Boldness and common sense. Our abiding sense of patriotism, belonging and community has made us strong and has carried us forward for almost 400 years. Let others engage in cheap shots and low blows. Let’s make our brand of politics positive and optimistic, instead of cruel and dark. And instead of the bickering and name calling that dominates much of today’s public debate, let’s build on the work of those who came before us.” Read the speech. Governor Chris Sununu delivered his inaugural address for his second term on January 3, 2019. Sununu touted the states progress on establishing full-day kindergarten, comprehensive child protection and welfare bills, tax relief for small businesses and creating long term solutions for substance use disorder crisis. The governor called on lawmakers to continue to build on this progress. “I implore this legislature to learn from the mistakes of the past. The last thing we should be doing is raising taxes or pushing a budget that does not live within our means,” said the governor. Sununu stated that he’ll submit a budget that keeps commitment to protecting a thriving economy by retaining and growing the workforce; investments in education, Medicaid expansion; reforming public assistance programs; battling the opioid crisis; an energy policy that lowers electric rates; and renewable energy initiatives that should benefit low income ratepayers first. Read the speech. After beginning his third term, Governor Andrew Cuomo delivered his ninth state of the state address on January 15, 2019 touting the states socially progressive accomplishments on a number of issues including marriage equality, minimum wage, organized labor, a nation leading environmental agenda, free college tuition, family leave program, and gun safety. Cuomo also expressed his gratitude for the highest number of jobs and lowest unemployment rate currently in New York, as well as economic development of a number of airport improvements and transportation projects throughout the state. Cuomo outlined a wide range of proposals to continue this momentum: increasing both education and healthcare budgets; continue investments in transportation and infrastructure projects; proposing a congestion pricing to establish a reliable funding stream for MTA; revitalization initiative; middle class tax cuts; equal rights; protection from health risks; clean water infrastructure; shellfish restoration program; a ban on plastic bags; and many more. During his speech, Governor Cuomo indicated that New York is suing the federal government over the 2017 tax law, noting the significant disincentive for high property taxes amongst New Yorkers. Cuomo concluded his speech by saying, “New York loves you if you are L or G or B or T or Q, if you are black or white or brown, if you are a Christian, a Muslim, or if you are Jewish. If you are a new immigrant or an old immigrant. New York loves you and what makes us great is we have no tolerance for hate in our state.” Read the speech. Governor Gina Raimondo began her second term on January 1, 2019 and delivered her fifth state of the state January 15, 2019. 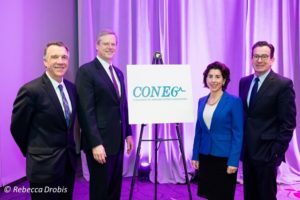 She touted the states progress on creating jobs, more road construction than ever, more Rhode Islanders on track to graduate from CCRI, cutting taxes, regulations and red tape for small businesses, improving schools, and noted that Rhode Island is the only state with an offshore wind farm. Raimondo’s legislative initiatives call for expanding investments in job creation and job training; investments in K-12 education; cutting taxes; investing in public parks, and beaches; support and empower teachers with additional school funding; bring a universal public Pre-K to Rhode Island; expansion of tuition-free community college from two years to four-years; propose another minimum wage increase; economic development initiatives; protect health care and take steps to lower premiums; expanding access to mental health care; a ban on assault weapons and high-capacity magazines and ban guns in schools. At the end of her speech, Raimondo stated “We can profoundly shape and strengthen the state we pass down to our kids. The decisions we make, the actions we take, the tone we use, all have the potential to be lasting and impactful.” Read the speech. Governor Phil Scott delivered his inaugural address on January 10, 2019 as he began his second term. Scott noted the negativity and hate that continues to divide us more that it brings us together. “We must look for common ground instead of highlighting or exploiting our differences, view consensus and compromise not as a weakness, but as a strength,” said Governor Scott. In his speech, Scott referenced his vision with a requirement to recognize and overcome obstacles in the way to achieve positive results. He noted the states demographics where the labor force has declined and educating fewer K-12 students in public schools – the trend continues. Fewer to share the costs of state government with ongoing needs in areas like transportation, building maintenance, public safety and human services. With these challenges, Governor Scott committed to grow the economy to support jobs, expand the tax base, and reinforce the health of Vermont’s citizens and environment. Scott proposes health insurance reforms with a focus on increasing affordability; protecting the environment by lowering emissions and offering settlement funds to help Vermonters purchase electric vehicles; transform the education system; create an affordable child care system that’s accessible; ensure businesses can stay competitive; and several others. Governor Scott concluded his speech with this statement. “As we open this new biennium, with the hope and promise of a new year, let’s commit to this work; put aside our differences to work together, to come together. To solve problems and help people each and every day.” Read the speech.